I don’t know where you guys are, but over here the last few days have been unbelievably hot, and there are more coming our way! Who wants to cook in such misery? No one. So I decided to share this recipe of a spread with you. It is just perfect for a scorching summer day. We usually have it either as a dip with corn chips, or spread on homemade gluten-free bread slices in no-fuss sandwiches. It is completely sulfite-free, provided you are careful about the ingredients you use. – canned tuna; now here I make sure the only ingredients are water and salt. In France the net weight showing on the can is 130 g, or 4.5 oz. – a dozen black olives, preserved in oil or water, without any vinegar. My favourite are organic “kalamata” olives. Again, you have to read the label carefully. 1. Pit the olives if necessary, then cut up into small pieces / slices. Drain the tuna. 2. Pit and and peel the avocado, and thoroughly mix with the lemon juice. Using an immersion blender will make things easier and smoother but you don’t have to. 3. 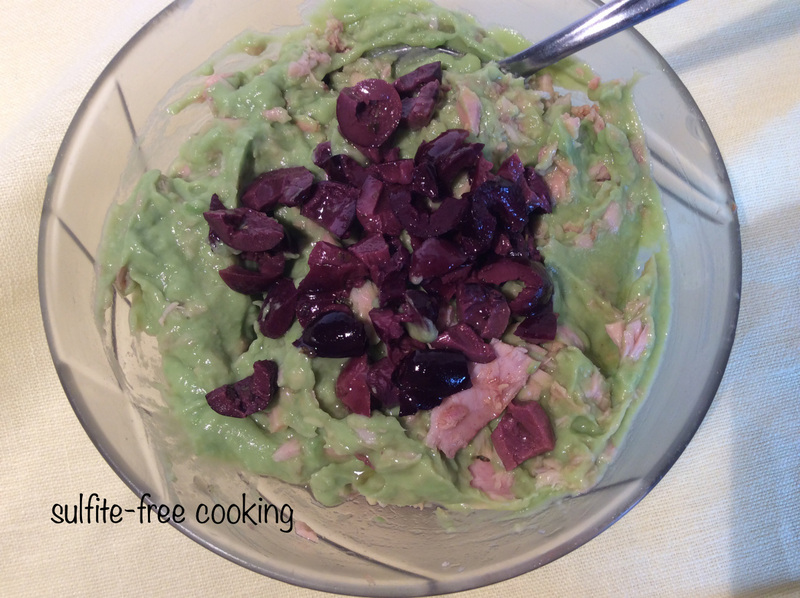 Add the olives and tuna to the avocado paste. Taste before adding any salt!